I just broke down an amazing classic 1973 Topps Baseball Set. These cards are in remarkable condition for being over 40 years old (solid EX+ to Near Mint condition) and as good as your going to find outside of a complete Mint team set. All of my 1973 Topps Baseball Team Sets that I have for sale consist of cards that are in Ex+ to NrMt condition. Most team sets will be split 70/30 on this type of conditioning. Most cards have very nice sharp corners, there might be a couple of dings or soft corners on a couple of cards. The only major flaw to the team sets is the centering of some of the cards (top/bottom). The cards have clean fronts and backs, no wax stains are present. There are several types of subset cards from the 1973 Topps Set that are not included in the team sets. These cards are listed below. However, if you would like to purchase any of these cards, please let me know. These cards feature the NL and AL League Leaders for the most popular statistics (hitting and pitching). Since each LL card features 2 players from 2 different teams, they will not be included in the team sets. The Rookie Cards feature 3 different players from 3 different teams. As I cannot split up the cards into 1/3's and I do not have 3 of each card to provide for team sets, they will not be included in the team sets. Hence the Rookie card that has Mike Schmidt will not be found in the Phillies team set as it is on the 3 player card. Please make note of this before your purchase a 1973 Topps team set. You can check out the links below to view pictures of each team and the cards available in each team set. If you wish to purchase any of these Rookie Cards, please contact me for price. The Schmidt Rookie Card is not available. Note: Playoff and World Series cards that feature the game winning team on the card will go into the winning team's team set. Example: The set features 7 World Series cards for a 7 game series. The team that won the 4 games will get those cards in their team set and the other team that won 3 games will get those game winning cards in their team set. 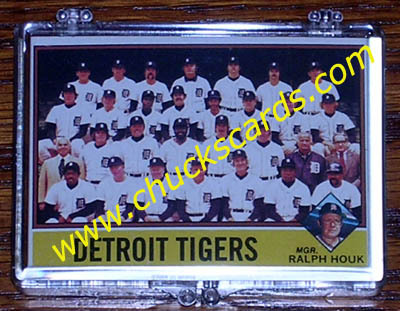 All 1973 Topps team sets are sent in a 35 count plastic case as seen below. The following team sets are currently available for 1973 Topps Baseball and their price.